Generates funding for veterans to participate in our veteran-led therapeutic adventure trips. Provides an opportunity to meet and inform the people in our communities about our initiatives and potential ways they can help either through volunteering or simply referring a veteran they know who could benefit from our program. This year’s raffle is made possible by the tremendous generosity and effort by: Terry’s Guns, Larry Dunbar, Rich Hollis, and Danger Close Armament. 1st place: For this year’s rifle we have a custom built Remington Model 700 chambered in 6.5 Creedmoor. The Remington M700 action and 24″ Mueller barrel are precisely fitted to a McMillan Game Scout stock. Completing the package is a Leupold VX-6 HD 2-12x42mm afixed with Leupold bases and rings. The model 700 is one of the most universally known and proven platforms on the market today. (Estimated value ~ $5500) Click image for more details. 2nd place: We have another exceptional pistol from Danger Close Armament. This year we have a CZ P-10C fitted with a Trijicon RMR and a host of other refinements that add to an already impressive platform. 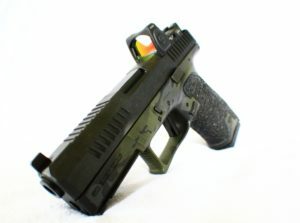 This is a professionally crafted pistol with functionality as the primary design focus. The folks at DCA have spent countless hours perfecting their design and ensuring their customers receive the most reliable product possible. (Estimated value ~ $2000) Click image for more details. 3rd place: Del-Ton Echo 316 AR-15 rifle chambered in 5.56 mm. Package includes (1) scope, (1) holographic sight, and (1) laser light. (Estimated value ~ $800) Click image for more details. Tickets are $25 each with only 1200 available. Persons must be 18 years or older to purchase or win a firearm and 21 to purchase or win a handgun. In accordance with state and federal laws, all purchasers or winners of a firearm must complete an ATF Form 4473 and successfully pass an (NCIS) background check through a Federal Firearms Licensed (FFL) dealer in order to take possession of their firearm. Our designated FFL dealer is: Terry’s Guns (State Farm Insurance), 1112 9th St. S, Great Falls, MT 59405, 406-761- 6211. If the purchaser or winner is unable or unwilling to meet the Federal requirements for firearm ownership or does not claim the firearm within 45 days of the event, the Montana Vet Program will retain ownership of the firearm for future fundraising events. If the purchaser or winner moves out of state prior to the event drawing that person is responsible for any fees required to retrieve their prize. You must make arrangements to have a firearm shipped to you from Terry’s Guns to another FFL dealer in your state. Winners are responsible for any applicable transfer fees for firearms.